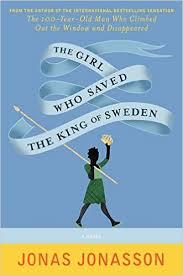 a book chick: "The Girl Who Saved the King of Sweden"
"The Girl Who Saved the King of Sweden"
my take: True confessions: I did not read this for book club. I knew I couldn't make the September meeting, so I went on to other things on my to read pile. Sister handed it to me a few months back and said it was good. Hmmm. Set it on the top of the pile. And was mostly glad I did. I tried to read Jonasson's other work - about the 100 year old man who climbs out a window - and could not get farther than a few pages - way too slap stick. The Girl Who Saved is less slap-sticky and has a sarcastic, even witty way, of dealing with terrible human crises, such as apartheid, nuclear war, nationalism, fanaticism, immigration, and more. Should you put in on the top of your pile? Hmmm. It's worth a read and if you are visiting Sweden soon (as I am) it would be lighter pre-trip reading than, say, The Girl with the Dragon Tattoo. For reals. my verdict: fun-ish ... maybe 3 stars out of 5. Could be a good beach read. Hmmm, not sure that review moves it to the top of my (virtual) pile, I have to say. I got a $1.99 Kindle copy but have never picked it when in need of a new book, so I guess that says something about my expectations... I do like to hear it's less slap-sticky and that it's a potentially good beach read, because I'm soon going to be in the market for plenty of those.